A gift of any amount will help achieve the vision of the Mercy Center Foundation USA. Your gifts help combat disease and poverty in Lare, Kenya, by providing clean water, medical care, education and micro-enterprise initiatives. Mercy Center Foundation USA, Inc. is a 501(c)3 organization. All donations are tax deductible to the extent of the law. Every child has the right to go to school, without danger or discrimination. The Mother of Mercy Girls Secondary School in the Rift Valley, Lare, Kenya joins with all schools in Kenya and the U.S. to support a girl's right to education. We join with the World Youth in supporting education for all! 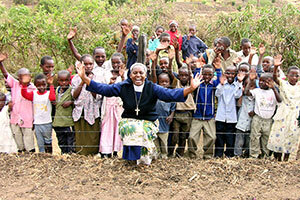 Help us by supporting this petition and supporting the Mercy Center's work in Kenya. Take Action now and sign the Kenya girl's Stand #UpForSchool Petition. Act now. "We, the world's youth, teachers, parents and global citizens appeal to our governments to keep their promise, made at the United Nations in 2000, to ensure all out-of-school children gain their right to education before the end of 2015. We are standing up to bring an end to the barriers preventing girls from going to school, including forced work and early marriage, conflict and attacks on schools, exploitation and discrimination. All children deserve the opportunity to learn and achieve their potential." "The mission of the Mercy Center Foundation is to help combat disease and poverty in Lare, Kenya, by providing compassionate and humanitarian assistance toward sustainable and affordable clean water, health care, education and micro-enterprise initiatives."